Plans to close two accident and emergency departments in west London have been scrapped, Health Secretary Matt Hancock has announced. 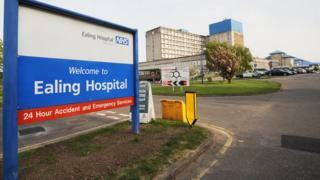 Ealing and Charing Cross Hospitals' A&E units had been expected to close as part of a programme to overhaul health services. But Mr Hancock said the Department of Health had withdrawn its support for the scheme after seven years. Campaigners welcomed the move but said it should have come sooner. The local NHS group said it had already spent £43m on consultants alone for the £500m project, Shaping a Healthier Future (SaHF). Speaking in the House of Commons, Mr Hancock said: "Shaping a Healthier Future is no longer supported by the Department of Health and Social Care, by NHS Improvement, or NHS England." He added: "The changes in A&E in west London, for instance at Charing Cross Hospital... these will not happen." Mr Hancock said the NHS would consider preserving elements of the project that fitted with its long term plan, such as a focus on expanding community treatment. SaHF launched in 2012 as part of plans to improve the health of two million people in west London. It led to the closure of Hammersmith and Central Middlesex A&E departments in 2014 and Ealing Hospital's maternity unit in 2015. But an independent report in 2015 found the plans were "deeply flawed". Eve Turner, from Ealing Save Our NHS, said the SaHF plans "were not just immoral but totally unworkable". "After seven years and millions of pounds squandered on management consultants they have finally accepted the emperor has no clothes," she said. "They must now restore our maternity, children's A&E and give Ealing Hospital the money it needs." Neither the NHS nor the Department of Health could confirm whether or not the hospitals would now receive investment to help them improve.